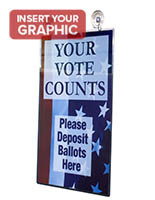 Designed to accommodate 8-1/2" x 11" signs. 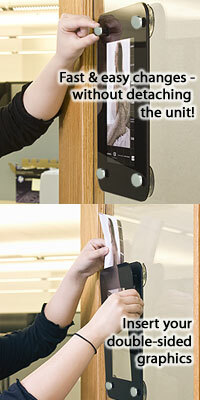 Suction cups included for easy mounting to non-porous surfaces, such as a glass door or window. 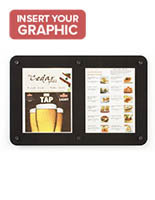 Double-sided design draws the attention of customers from multiple directions. 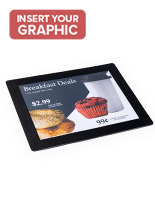 Black frame is the perfect accent for most printed advertisements. Plastic lens for protecting posters from finger prints. These signholders, door signs are an ideal solution for posting information in an office, or advertising special promotions within a retail or restaurant establishment. 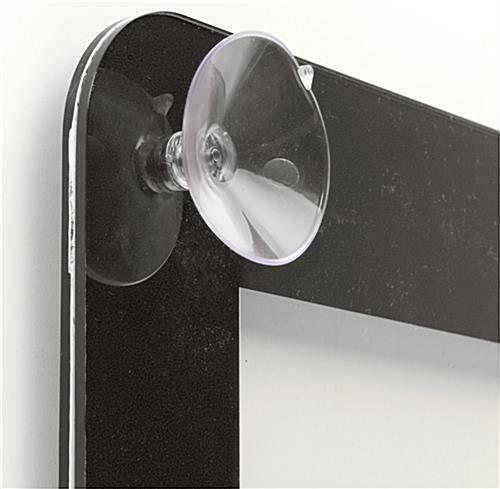 Each of these poster holders are constructed from acrylic for use in a variety of settings. 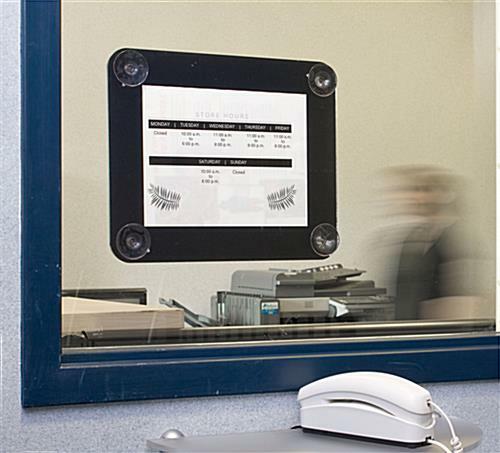 The door signs have a clear center window, enabling users to present printed advertisements back-to-back. 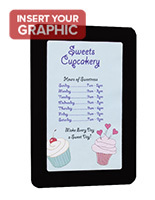 The shiny, black border further emphasizes the displayed graphics, ensuring your messages get noticed. These door signs feature suction cups and can be easily attached to any non-porous surfaces, in either vertical or horizontal orientation. 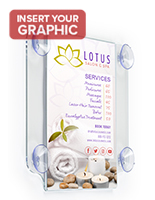 These poster holders can be used by a wide variety of businesses or Point of Purchase locations. 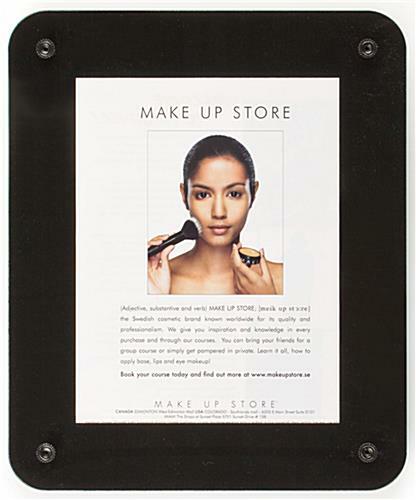 Retail stores can attach the suction-cup door signs to glass storefront windows and display "Clearance" or "On Sale" posters. 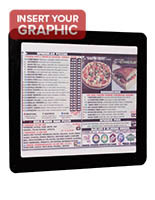 The acrylic frames can also be used to showcase menu listings in a restaurant window as well. As a result, these door signs are the perfect way to communicate messages to visitors and guests even after your business has closed for the day. These door signs also permit fast and easy graphic changes. Simply unscrew the decorative caps and separate the two acrylic panels. Next, place your door signs in between the plastic panels. Finally, secure the knobs once more, and your signage is ready to be displayed! 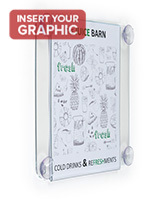 These door signs have an easy-to-use design, making them perfect for use within any establishment needing to frequently change or update their displayed advertisements. 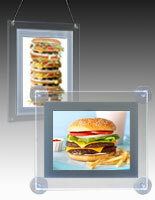 Many other sizes are offered, in addition to the 8-1/2" x 11" frame seen here. Please see related products for more options. 15.0" x 12.5" x 1.5"
We ordered these for our event center because of their professional look in the pictures. What the pictures do not show are strips of double sided white tape that come already stuck to one side. The tape cannot be removed easily and does not give that professional doubled sided advertising from both sides. The tape shows on the back side. Andrew, thank you so much for taking the time to share your feedback with us. We are disappointed that our product did not meet your expectations, and we would like the chance to make this right for you. We'll have a customer care specialist reach out to assist. We use these signs at all our locations and they work very well for our purpose! Thank you for sharing, Janet! We are happy to hear that these are working out so well for your in multiple locations. We welcome images of these in use if you'd like to share on your review! This is a great product ! Very professional appearance, easy to use. Great review, Ron! We're glad you're satisfied with your order. The suction cups didn't hold for long, and the sign fell and cracked. (Thank goodness for excellent customer support!) Also, this holder is NOT designed for signs that change. The sign is supposed to be placed between two sheets of plastic. There is strong double-sided tape around all 4 sides of the opening to hold the plastic sheets together, which makes it very hard to open back up and switch the sign out. 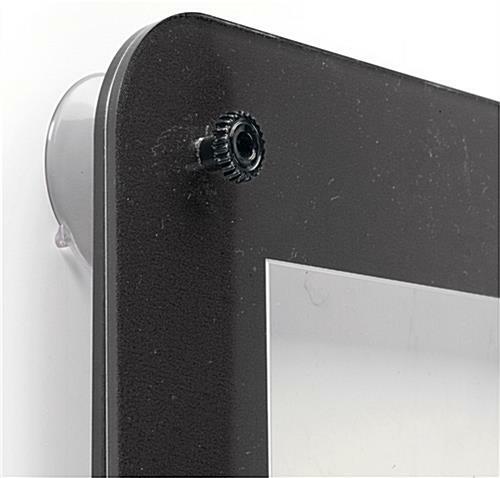 You could peel off the tape and trust to the screws that hold the suction cups to the standoffs to keep the paper in place, but even then you'll have to unscrew and rescrew it each time you change the sign. On the upside, it looked really nice while it lasted. We are sorry that you had some issues with your order, Jillian. A customer care representative will contact you shortly.